As negotiators from 195 countries head to Bonn, Germany, for annual climate talks, tensions are emerging over the timetable for raising ambition. One of the key outcomes due from the two-week meeting is to agree the format for an event known as the “facilitative dialogue” in 2018. It is the first political moment for leaders to start closing the gap between the goals of the Paris accord and voluntary national contributions. A proposal from Fiji, which is presiding over the talks, and last year’s host Morocco, said this should result in “greater confidence, courage and enhanced ambition”. China, India and other emerging economies have made clear they will not accept any pressure on countries to ramp up their national targets, however. Some are expected to argue that the event should result in specific pledges from countries to increase their efforts. But Scroll.in reported a group known as the like-minded developing countries is ready to fight any stipulation that the dialogue should raise ambition. The Fijian proposal is “not acceptable”, one anonymous Indian negotiator told the news outlet. The UN’s Emissions Gap Report just published shows how little difference cutting US and EU emissions can make. Even if the rest of the world manages to avoid increasing emissions any further, emission totals will still remain well above the 49GtCO2e measured in 2010. The Paris Agreement itself specifically stated that, even if all of the INDCs were carried out, global emissions would rise to 55 GtCO2e by 2030. Currently they stand at 51.9 GtCO2e. It seems to me that any plan that proposes to control the weather is already far too ambitious. Without these annual jamborees, what would the thousands of delegates do with their worthless lives? Well, Phillip, at least they’re holding it in an inland European city this time. In winter. Maybe a good time for a static high pressure system over Germany, so there ain’t no wind or solar power? That was also my thought. I think the sentence may have been constructed by the Corporate BS Generator. So what is happening in 2020? Many sources predict the world to start cooling then, 2019 to be precise. ‘raising ambition’ just means raising the insanity level. It would all be hilarious–except for the cost to all citizens. If you read Agenda21 …. that is if you can wade through the deliberate obfuscation …. the plan is to intimidate, shame, and shun countries that do not agree to the “plan”. No where does it state or give anyone authority to force countries into anything. Climate Change NDCs are being handled according to the “plan”. Land usage, property ownership, business ownership all have a “plan”. People need to wake up to what the UN has evolved into. Translation: Give us money and technology until you are as poor as we are. Back in the 1950s we would have missionaries come to our poor neighborhood church and ask for donations to help the village in Africa where they would stay for a few weeks while planning their visits to other poor neighborhood churches. Now we call them climate activists or social justice warriors but now the money involved is 1 or 2 orders of magnitude greater. The UN (COPs) Parties are more expensive. It’s interesting how Xie Zhenhua’s name keeps cropping up. But not surprising: he is, and has been for a long time, China’s chief climate negotiator. He speaks excellent English and has a thorough grasp of the relevant texts and of how negotiations have developed over the years. Here are a few examples of his position. Xie denied the suggestion that the country’s CO2 emissions had reached peak levels. In my view, these quotations epitomise international climate negotiations. The West has been totally outmanoeuvred – left holding two babies (one requiring economy damaging emission cuts and the other an obligation to make vast financial transfers) whereas “emerging economies” are free to prioritise economic development. We’ve been humiliated – but so cleverly that, apart from Trump, we haven’t noticed. There are currently 273 gigawatts of coal capacity under construction around the world, and another 570 gigawatts in the pipeline, the U.N. says. That would represent a 42% increase in global energy production from coal. Does anyone really think developing countries who need coal as a cheap source of fuel to grow their economies will suddenly call it quits? Many in business know the Paris Accord was a con that gave developing nation a free pass on emissions. In Bonn those bureaucratic functionaries for a bunch of wannabe global leaders hopefully catch a bad bout of international frostbite following the formal fixed smiles. 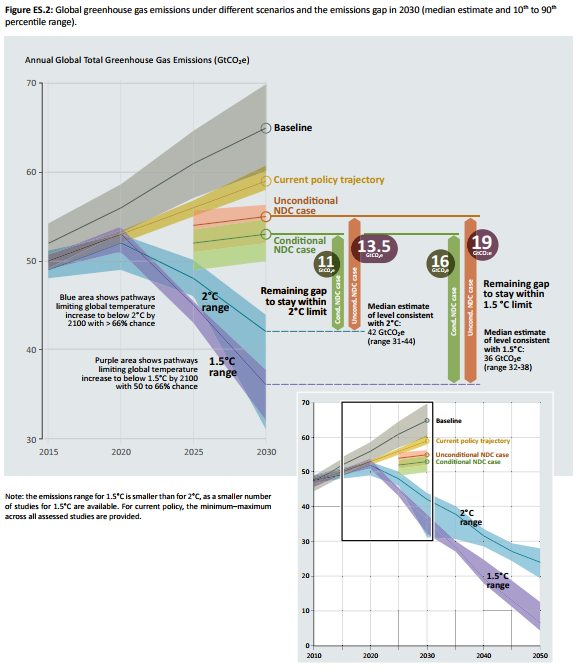 The UNEP Emissions Gap Report referred to above has a more relevant graph for the talks to ponder over. Figure ES.2 (page xvii) clearly states the gap between estimated emissions under current policies (if fully implemented) and the emissions commensurate with 1.5°C and 2°C warming objectives. As the Conditional NDC emissions gap is based on receiving external funding which has not emerged, it is the Unconditional NDC emissions gap that is relevant for the discussions. The emission cuts objectives of 13.5 and 19 GtCO2e are around one quarter and one third lower than with current policy. This to be achieved in just 12 years from now. The Executive Summary of the UNEP Emissions Gap Report can be found HERE. Avoiding building new coal-fired power plants and phasing out existing ones is crucial to closing the emissions gap. Well, it may be crucial but there’s no possibility of it happening. China, the EU28, India and Japan are on track to meet their 2020 pledges. Sounds great. 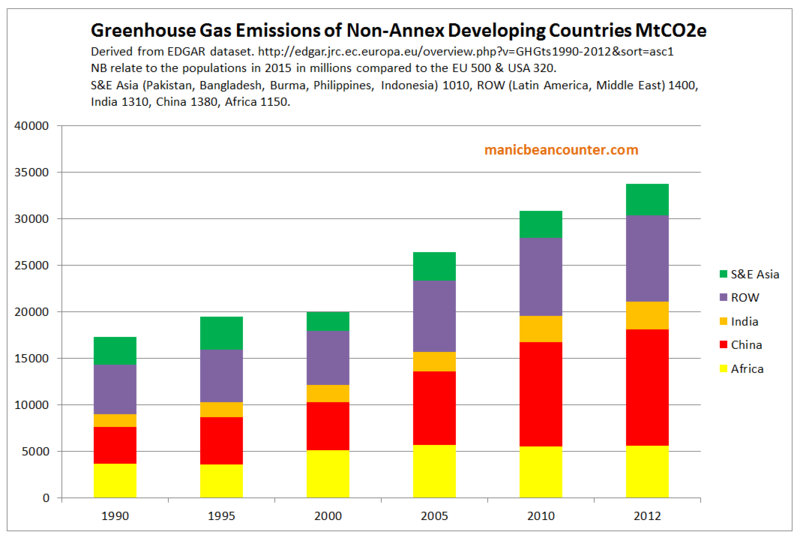 But, of course China’s and India’s NDCs say nothing about reducing emissions anyway – ever, not just by 2020. And, as for Japan, this THIS. Gulp – we’re all doomed! The assessment shows that for many countries, implementing their NDC would lead to lower emissions than the current policies scenario, or in other words that additional policies will have to be implemented to meet the NDC target. The level of ambition embedded in NDCs varies considerably: for some countries the NDC target is actually above current projected policy case emissions. With this caveat, recent studies assessed suggest that Brazil, China, India and Russia are likely to – or are roughly on track to – achieve their 2030 NDC targets with currently implemented policies. Conversely, Argentina, Australia, Canada, the European Union, Indonesia, Japan, Mexico, South Africa, the Republic of Korea and the United States are likely to require further action in order to meet their NDCs, according to government and independent estimates. There is no relative assessment of individual country current policy proposals in the context of the global emissions reduction objectives, but there are assessments of movement towards the policy objectives. In terms of Figure ES.2 above, there are examples of where current trends will result in emissions above the Unconditional NDC case. But there are no quantitative examples of where the biggest improvements in policy ambition are required to close the global emissions gap, nor even some sort of grading of the policy proposals. The emerging countries that are unwilling to even countenance increasing any policy constraints on emissions, let alone cutting their emissions, comprised over 60% of global emissions in 2012, over 80% of the global population and accounted for just over 100% of the growth in emissions from 1990 to 2012. From the EU EDGAR dataset, I have compiled a graph of these non-Annex countries under the 1992 Rio Declaration. Collectively they had 33800 MtCO2e (33.8 GtCO2e) of emissions out of 53.9 GtCO2e GHG emissions in 2012. Excluded from the graph are International Transport 1.2; Japan 1.5, Russia 2.8; USA 6.3; and EU 28 4.7. Within the EU 28 is the United Kingdom with 0.586 GtCO2e. The policy objective is to reduce global emissions to around 36 GtCO2e (1.5°C warming) or 42 GtCO2e (2°C of warming) by 2030. This is not going to be achieved if the emerging economies do not decrease their emissions. If this does not happen countries, like the UK, with drastic emissions reductions policies are imposing huge costs on their peoples with no expected significant difference to global emissions resulting. The whole point is to strangle the west in to submission and ultimately bancruptcy. They have already clearly stated their twin aims of “A massive re-distribution of wealth” and “the replacement of Capitalism” with their new order, which is basically Communism, with their “New World Order” in control of the purse strings. It is amazing that no UK politicians can see this foolishness and continue in their blind determination to wreck the UK ‘s energy system. Their advisors should be held to account! It is not just the extra costs that energy policy imposes. By imposing extra costs on industries, when many competitor countries are not, puts Britain at an increasing comparative disadvantage. Countries like India and China will play along as they are amongst those gaining.